At Lockcentre, we provide some of the finest quality products in the 'Electric Locking' market from some of the major manufactures ASEC, Adams and Cisa. These 'Electric Locks' vary in the pressure and can withstand, between the lowest weight of 295kg to the highest weight of 1750kg depending on the model. Most of the products in this range use a battery powered mortice lock system which ensures maximum and reliable security. 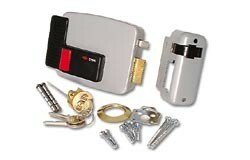 As an alternative some of these locks use a battery powered magnet system which is just as reliable but increases the strength of the locks.